Delicate Arch is one of the main attractions in Arches National Park. This is a National Park near Moab, Utah that consists of over 75,000 acres of desert and over 2000 natural arches. This region has the highest density of natural arches of anywhere in the world. In this article, we discuss Delicate Arch in greater depth, answering some popular questions related to accessing and experiencing it. Towards the end of the article, we offer our final thoughts on the future of Delicate Arch. WHAT ARE THE FEATURES OF DELICATE ARCH? WHAT ARE THE BENEFITS OF DELICATE ARCH? What are the Drawbacks of Delicate Arch? What are Some Tips for Visiting Delicate Arch? Delicate Arch can be accessed via Delicate Arch Trail, which is a 3.2-mile out-and-back trail. This means that Delicate Arch lies about 1.6 miles from the initial trailhead. This trailhead is near a parking lot which is close to the Wolfe Ranch, an old cabin whose owner took one of the earliest known photographs of Delicate Arch in the early 20th century. The hike to Delicate Arch contains an elevation gain of 670 feet. Many geological formations can be seen along the way with an array of stunning colors. The hike starts off on a wide trail but gradually narrows as the ascent progresses. The narrowing reaches its culmination towards the end, as the trail hugs a steep ridge before revealing Delicate Arch in the distance. Overall, this hike is considered moderately difficult due to some steep sections and rugged terrain. Hikers must be careful to follow the rock cairns at the end of the trail, as there are few other markings here. Furthermore, there is no shade on the trail, making conditions practically unbearable during the summer. Hydration is a big concern and most veterans of the trail recommend bringing twice as much water as you expect to drink. Winter conditions can also be challenging, as snowfall can make parts of the trail slippery and dangerous. Still, the trail rarely closes, instead encouraging visitors to bring traction devices and trekking poles. Delicate Arch is 60 feet tall and is formed of Entrada Sandstone. This formation was deposited sometime between 180 and 140 million years ago. Weathering and erosion gradually shaped this formation over many years into the famous shape it is today. 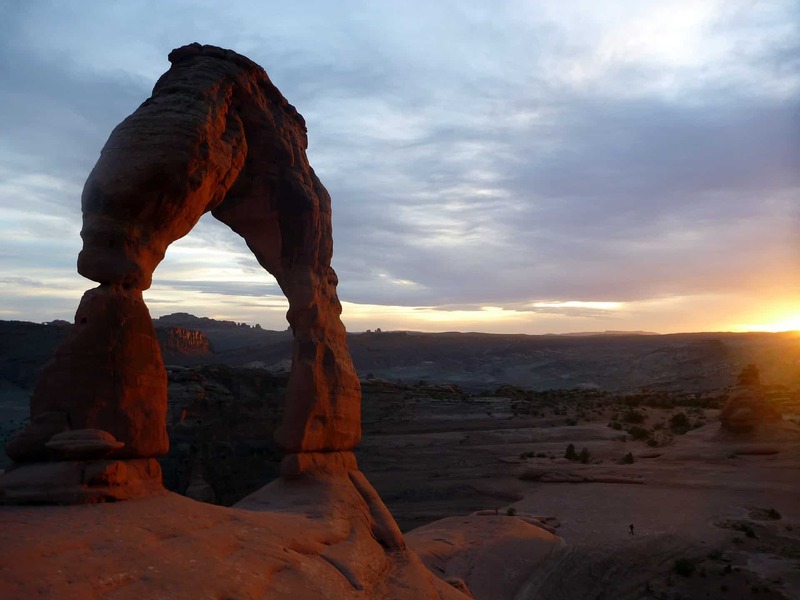 A picture of delicate arch is shown on Utah license plates, making its shape widely recognizable. Despite its inspiring nature, visitors are prohibited from climbing on the arch. Delicate Arch is a must-see landmark in the western US. Of the over 2000 natural arches in Arches National Park, Delicate Arch is by far the most popular one to visit. This popularity results in a palpable energy both on the trail and at the actual arch. This energy is especially heightened at sunrise or sunset when golden light covers the arch, resulting in a magical scene. The trail that leads to Delicate Arch takes no more than an hour and a half to complete, offering visitors quick access to this natural wonder of the world. Many people use the trail as a short, intense workout, as the steady ascent is a good opportunity to push yourself. No matter how many pictures of Delicate Arch you look at, witnessing it up close is an incomparable experience. The arch is a behemoth structure that almost seems alien when contrasted with many modern cities. Yet, it fits in perfectly in Arches National Park, which is full of similar rock formations and geological structures. Delicate Arch would be a great site for a photograph not only because of the arch but also because of the landscape the surrounds it. Many people want to get their picture taken in front of the arch, so they can cross it off their bucket list. In this sense, Delicate Arch would be a great location for any tourist or family. Many people like to visit Delicate Arch as early as possible, as this allow them to beat the heat and the crowds. If you manage to get to the arch early enough, you might have most of the area to yourself. At the very least, there will be minimal crowds. This might allow you to take a moment and meditate, using the space to silently reflect on the beauty of nature and the power of time. Delicate Arch was formed over many millions of years as the sandstone was withered down. In a sense, it represents a piece of natural art offered by our planet. Artists will especially appreciate the many colors of red on display in Arches National Park. The area has inspired many artists over the years. In fact, there is even some rock art in the park that has been attributed to the Ute people. This art includes pictures of sheep, horses, and dogs. This shows that the area has been a hotspot for creativity over the years. The weather is the biggest drawback of the area by far. During the summer, Delicate Arch can get above 100 degrees Fahrenheit by mid-morning, making the only ideal times to visit the arch early or later on the day. Yet, this small window of time might be inconvenient for some travelers, leading to them missing out on Delicate Arch. Furthermore, these small windows of ideal entry lead to even larger crowds. Almost 2 million visitors are already expected this year. For comparison, there were only 1 million visitors in 2010. This means that Delicate Arch might be growing in popularity at an unsustainable rate. In several years, it might be difficult to find a parking spot at the trailhead regardless of what time of day you go. Some visitors prefer the quietude of nature and try to avoid large crowds. Delicate Arch would not be an ideal destination for these kinds of travelers, as the large crowds can result in loud noises, dirty conditions, and general pandemonium. Many visitors bring their dogs, and this can be disrupting, especially if you are allergic to dogs. Lastly, the hike to Delicate Arch might not be ideal for younger children, older adults, or pets during the summer. This is due to the heat, the steep ridges at the end of the trail, and the steady ascent. Coming with many small children could be especially disastrous as you would likely have to carry their water and supplies, which could exhaust you sooner. In the desert conditions, every bit of saved energy is valuable. If you do plan on coming with kids, make sure to plan your excursion well in advance. It might be ideal to go during the fall or spring when the temperatures are lower, and the crowds are smaller. Winter conditions can be dangerous due to ice, so make sure you check the conditions before going. Generally, sunrise is less crowded than sunset, though both are still popular times. If you decide to go at sunrise, we recommend getting to the trailhead at least 2 hours before the anticipated sunrise time. This will give you plenty of time to hike to the arch and witness the landscape transform from dark to light. If you arrive at the trailhead right at sunrise, you will likely miss some of these magical transformations. We also recommend bringing more water than you anticipate drinking. This cannot be emphasized enough, as the sweltering heat, lack of shade, and steep ascent can quickly lead to dehydration if you’re not prepared. One method for ensuring that you have enough water is to bring a hydration pack with a water reservoir. These hold lots of water and can be conveniently carried like a backpack. Hikers can also store other supplies in this bag, like various snacks for refueling. We recommend bringing nuts and dried fruit, as this food is delicious, filling, and portable. Fresh produce could go bad over the course of your hike, especially during the summer months. It’s also important to bring some kind of bag to carry your food waste. This is especially important since so many people visit the Arch each year. Keeping the space clean should be a priority for every visitor. Lastly, we also recommend bringing a large hat or some kind of article for covering your face. The sun can be brutal, causing severe sunburn if you’re not careful. This is true even in the fall and spring months, as there is very little shade to protect you from the Sun. We think Delicate Arch is a magical location that is well worth the heat and crowds. Even though there are some negative features of visiting a crowed National Park, there are also some benefits. On some holidays, for example, the energy at Delicate Arch is electric, and the joy and love that is palpable is practically contagious. Travelers looking for a more social experience will appreciate these crowds, as they can start to feel like family after a while. We think Delicate Arch will continue to be a popular destination in the future. This is because it offers such a contrast to modern life. It’s certainly not every day that you get to see a 60-foot natural arch.